Online presence is a must in the current times and if you are a freelancer then you will surely reap great benefits by having a website. If you will have a website then you can clearly tell the world about your skills and the kind of work you do. It will help in attracting the target clients and the amount of work that you will get will surely increase. Even if you are on social media platforms, online directories, forums etc. then also you should think about having your own freelance website. A website will help in creating your online portfolio and people will get a proper gateway to know about your work. 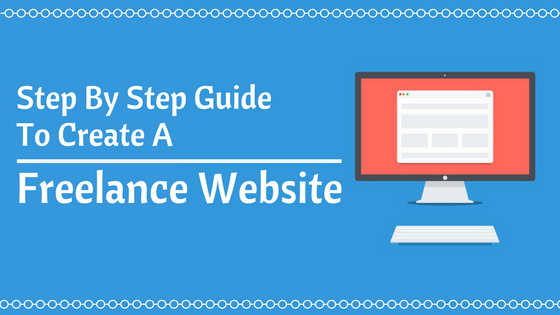 Here you will get step by step guidance to create a freelance website. So, stay tuned as the best information is about to be shared in the coming paragraphs. First of all choose an ideal layout for your website. Layout is nothing but the visual structure of the website. See the elements you want, the proper flow of content, the presentation style, the visual appeal etc. There are lots of layout templates available online and there is an option of customization as well. So, the first step is choosing an impressive layout that will help in giving a proper structure to your website. While creating a freelance website you should not ignore the power of branding. Give a name to your website. Think about different options and then check that which domain name is available. Choose the best one for your website. Select the domain name that is easily identifiable and work on the seo tactics to improve the online visibility of your website. Once the domain name has been finalized then work on the other aspects like logo designing, use of correct fonts, colors, spacing etc., promotion of website on social media platforms, using the power of advertisement, designing brochures, business cards etc. One of my friend, who is in Photography recently started his website. For photography logo designing, used free tool like Canva, used Wordpress to build a website and many more. You can also do the same. Home page – Home page is the main gateway to the website. Home page should be attractive, informative and nicely designed. Include beautiful background, images, descriptive text and other features to make it captivating. Services – Tell the services that you offer and the rates for different kinds of projects. Make sure to add a call to action tone in this section. Projects – Create a page that highlights the projects that you have completed till date. It will tell the masses about your professional experience. Testimonials – Create a separate page for testimonials where people will get to know the positive feedbacks posted by the clients. About page and contact us section – In these pages give the details about your activities and provide easily accessible contact information like email id, phone number, link for social networking sites etc. Other sections – Some other pages that you can include in your freelance website are like FAQs, Blog posts, online store link etc. Use sophisticated design features and it will really help your freelance website to stand out from the crowd. Your website should be highly creative and a visual treat for the eyes. Use cool designs, amazing content and the right methodologies for overall integration. Some examples are like customized grids, hover effect, animation techniques; video based content, parallax scrolling etc. Use some brilliant design features for creating an outstanding website. Use the right business tools in your freelance website. Some of the examples are like an option for online booking round the clock 7 days a week, a platform to accept secure online payments, a section where you can get the direct feedback and suggestions from the clients, the option of sending automatic reminders through email etc. These kinds of business tools will help in creating a perfect freelance website and the interaction level with the clients will increase. The above mentioned points clearly describe that how you should proceed while creating a freelance website. When you are creating a website then bring out your best tech capabilities and don’t forget to do seo homework. Make sure that the website is mobile friendly and always include the option of sharing the information on your website.